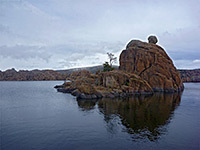 There are many small reservoirs in the hills of central Arizona, but Watson Lake is perhaps the most unusual and photogenic, as most of the shoreline and the surroundings are formed of huge, rounded granite boulders, some of which are semi-submerged forming tiny islands or narrow promontories. 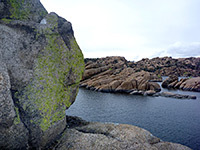 Contrasting with the blue-grey waters and the brownish rocks are the emerald green leaves of aspen trees, found scattered amongst the boulders. 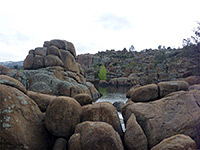 Similar granite landscapes are found in other places nearby, a few miles north and west of Prescott, including Granite Mountain, Granite Dells, and Willow Creek Reservoir, a mile from Watson Lake but not quite as scenic. Both lakes were created early in the 20th century, and are popular mostly for recreation, charging a small fee ($2) for day use. Many people come here just for boating, fishing and picnicking, yet the scenery is quite special, enjoyable to explore and good for photography. Watson Lake is the most developed of the two. Watson Lake lies on the north side of Prescott along AZ 89 (1.2 miles north of the junction with Prescott Lakes Parkway), and is managed as a city park, complete with such park-like facilities as a playground, bbq area, horseshoe pits, restrooms and a campground (summer only). Past the self-service entrance station, several short side roads lead to overlooks, shoreline access points and boat launch sites. The granite boulder piles extend all around the northwest and northeast shores, and line the exit stream (Granite Creek), which flows north across Chino Valley towards the Verde River. Rocks are similar in shape, color and form to the extensive outcrops in Joshua Tree National Park and many other places in the Southwest. The land on the southeast side of the lake is more traditional - flat, bushy and gently sloping, rising gradually towards 6,178 foot Glassford Hill. The park has a few short trails, carefully routed along fairly level terrain between the boulders, though it is more interesting to scramble around other locations, in particular along some of the narrow ridges that project out from the shoreline. Just as in Joshua Tree NP, the firm, abrasive surface of the boulders make them favorable for rock climbing. The nearest towns with hotels close to Watson Lake are Chino Valley (12 miles), Prescott (4 miles) and Prescott Valley (10 miles).